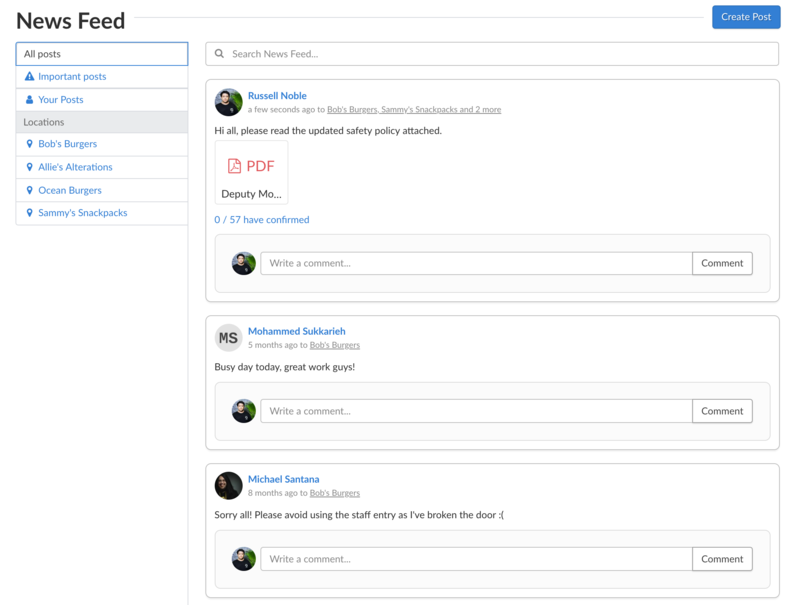 The News Feed is the main communication hub for your business in Deputy. The News Feed allows you to communicate with your employees. 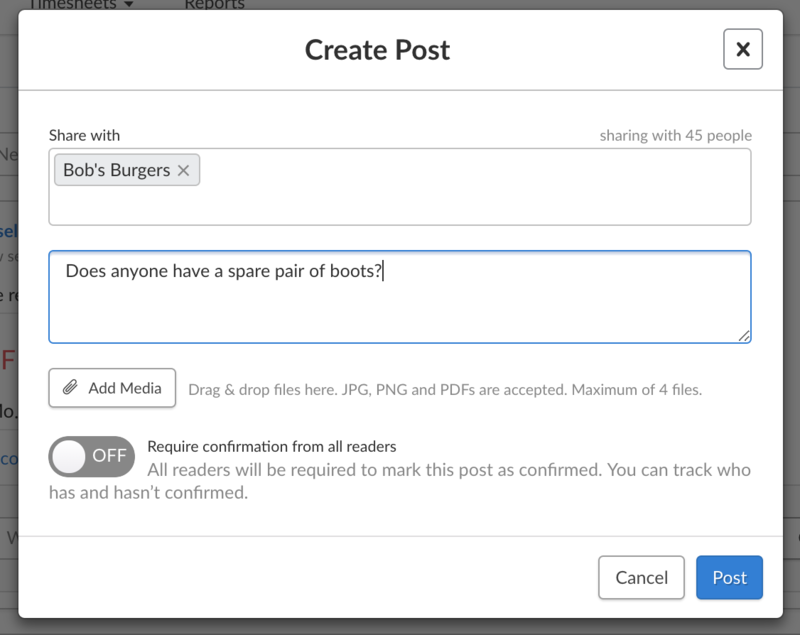 You can send a post directly to an employee (or group of employees), upload photos and PDFs and request confirmation of a particular post. It’s a great way to track which employees have signed off on important policies and procedures. You can also view the full log of past announcements, meaning you'll be able to see who made a particular post and when. Any staff member may create a post, however employees may not require confirmation of any other staff members, only those lower in the hierarchy. You may make a post (or comment on/confirm one) using the latest version of the smartphone and Kiosk apps, as well as on the web. 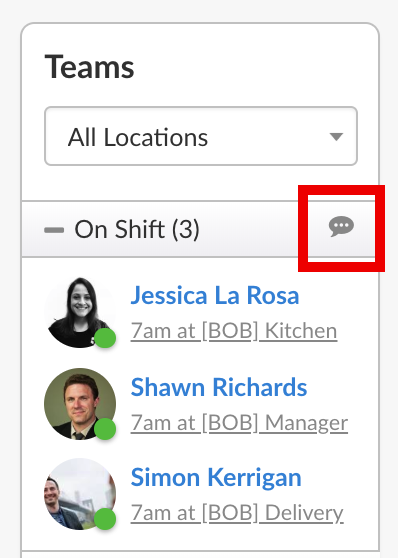 You can see and share posts with team members you have access to, meaning those you share a workplace with or those you manage. You are only able to see messages that are relevant to you; if for example an employee posts to a location you will be able to see and comment on it, however if an employee sends posts directly to another team member, you will not be able to see it unless you were also selected by an employee. To make a post on the web, first go to the News Feed using the Navigation Bar at the top of the screen. Near the top of the screen you will see an option reading "Create Post". Please click it to create a post. 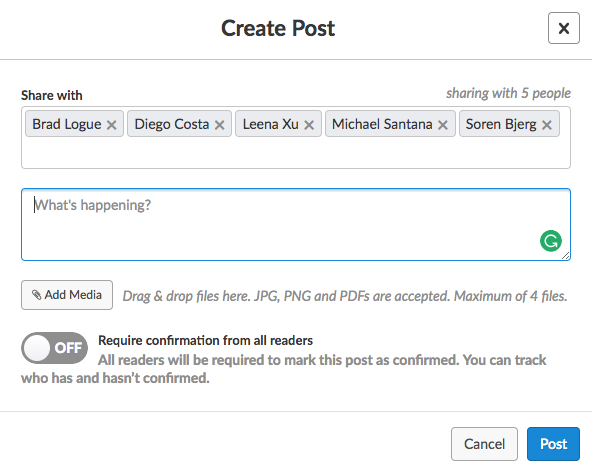 After creating a post, you will be asked who you would like to share it with. When you click in the box, you will see the full list of locations and staff members. Rather than scrolling through the list, you may type the name of the location/person you'd like to share the post with, then click the name when it appears. Alternatively, you may select "All" to share it with everyone. 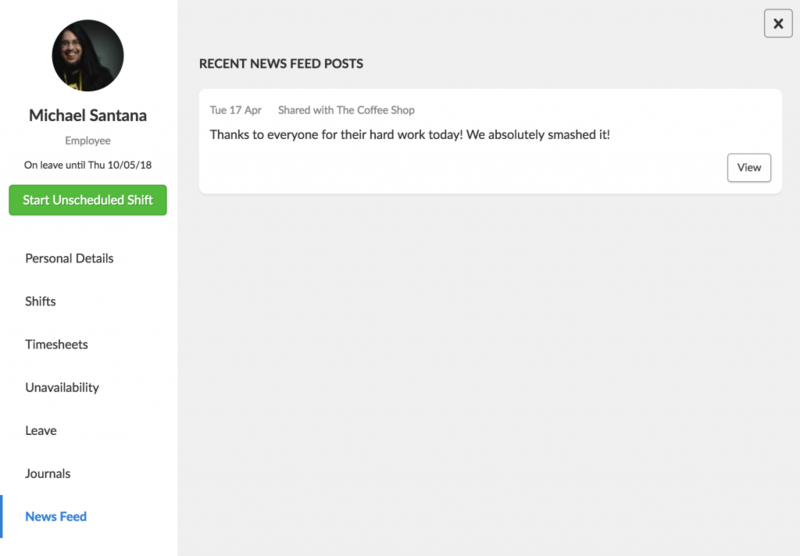 This means that you may now post to a single staff member, which they may now reply to by commenting on it. Next, please enter the text of the post. This can be anything you'd like to add, whether it be a short message, a link, or a long post. The character count has been extended to 3000, so you have quite a bit of space to work with. If you would like to attach a file to the post for your team to view or download, please click the "Add Media" button. You may attach JPG, PNG, and PDF files to the post. To attach the file, find it on your device then select it and click "Open". You may attach up to 4 files, however there is a limit of 10MB per file. Finally, you may select to "Require Confirmation". This means that any team members subordinate to you must sign off that they have viewed the post by clicking "I Confirm". 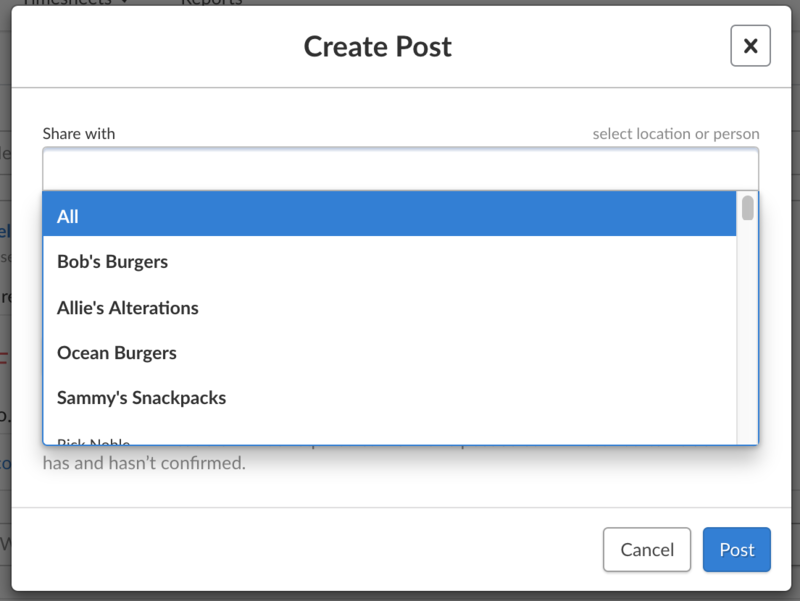 This allows you to track which team members have signed off on an post. After making the post you will be able to view this by clicking the link under the text of the post. To comment on a post, simply find it in your feed, click the comment box, then tap "Post". On the News Feed tab you can find your filters over to the left. Changing your filters will display the relevant post in the News Feed. You may filter by All Posts, Important Posts (those marked as requiring confirmation) and Your Posts (those that you created). You may also filter by posts in a specific location by selecting that location on the left. By default, any posts marked as "Requiring Confirmation" will be displayed at the top of the list of posts. At the top of the News Feed you will also see a search bar. You can type in this search bar to look for either the specific content of a post, or for the staff member who posted it. The system will search for all posts fitting the criteria within your currently selected filter. You can now also find posts left by a team member by viewing their profile from any page. Simply view their profile and click the 'News Feed' tab.